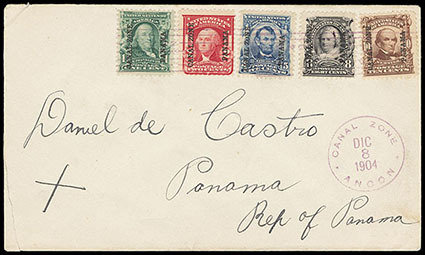 Canal Zone, 1904, 2c rose, block of 4, purple bar cancels, top stamps with "Panama" 15mm long, natural s.e. at top, Very Fine, a rare used multiple, catalog for normal block with no premium for variety of which only 260 were produced. 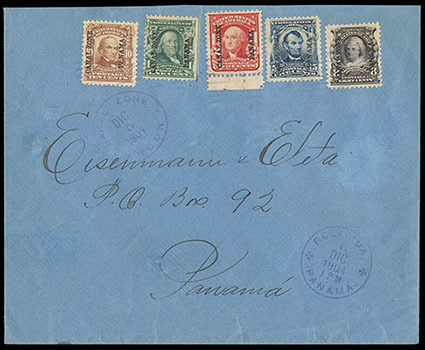 Canal Zone, 1904, 2c rose, choice centering and rich color, tied by "Bohio, June 30, 1904" cds and bar handstamp on "Nativos" picture post card to Colon, Cristobal same day postmark at left, Extremely Fine, it is believed that not more than ten post card usages exist; with 2000 A.P.S. certificate. Scott No. 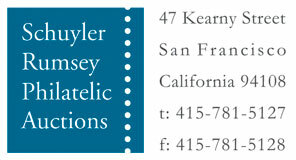 1 Estimate $750 - 1,000. A CHOICE AND RARE POST CARD USAGE BEARING THE 1904 2C MAP ISSUE. Canal Zone, 1904, 5c blue, block of 4, neat bar cancels, nicely centered, bright color, Very Fine and choice, a lovely and scarce used multiple, with only 21 blocks reported. 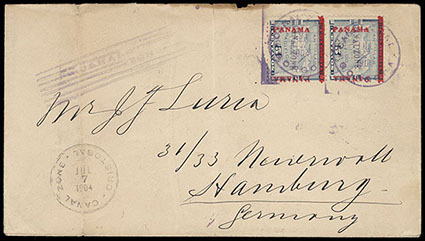 Canal Zone, 1904, 5c blue, vertical pair, tied by purple "Gorgona, Jul 7, 1904" cds's with matching bar handstamp at left on cover to Hamburg, Germany, Cristobal transit and reverse with Colon, N.Y. transits and receiving postmark; cover folds and edge flaw at top, F.-V.F., a scarce foreign destination usage and usage from Gorgona. 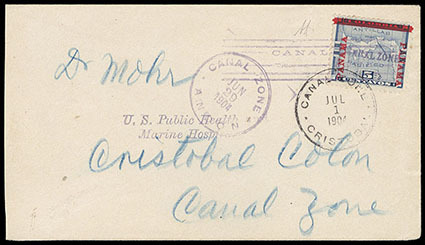 Canal Zone, 1904, 5c blue, well centered, tied by purple "Canal Zone" bars cancel, matching purple "Ancon, Canal Zone, Jun 29, 1904" cds to the U.S. Public Health and Marine Hospital Service at Cristobal, black "Cristobal, Jul 1, 1904" arrival cds additionally tying stamp; cover slightly reduced at left, Very Fine and choice. 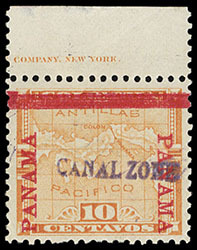 Canal Zone, 1904, 10c yellow, top margin single with part imprint, o.g., lightly hinged, fresh with rich color, Very Fine and choice; with 2015 P.F. certificate. 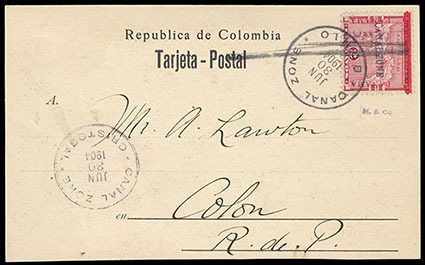 Canal Zone, 1904, 10c yellow, tied by bar cancel with matching "La Boca, Jul 11, 1904" cds alongside on fresh cover to Colon, with Cristobal transit cds and receiving backstamp, Very Fine and choice. Scott No. 3 Estimate $150 - 200. 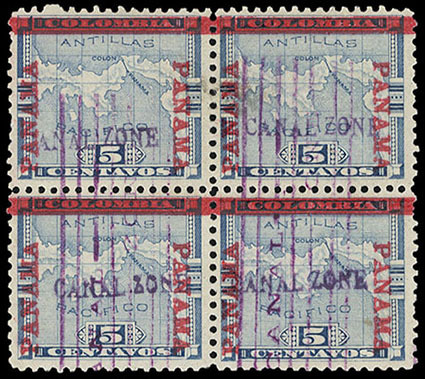 Canal Zone, 1904, 1¢-10¢ overprinted U.S. complete, rich colors, 1¢ with natural s.e., tied by light bar cancel on cover to Panama, with matching "Ancon, Dic 5, 1904" cds below, receiving cds at bottom right, reverse with additional Panama transit cds, Very Fine. Scott No. 4-8 Estimate $400 - 600. 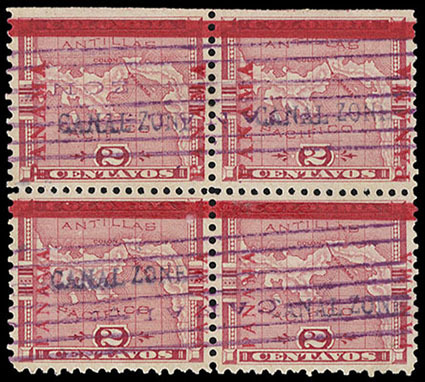 Canal Zone, 1904, 1¢-10¢ overprinted U.S. complete, tied by pink "Canal Zone" cancels, matching "Canal Zone, Ancon, Oct 6, 1904" cds on legal-size Panama Rail Road Company corner card cover to New York N.Y., F.-V.F. Scott No. 4-8 Estimate $300 - 400. 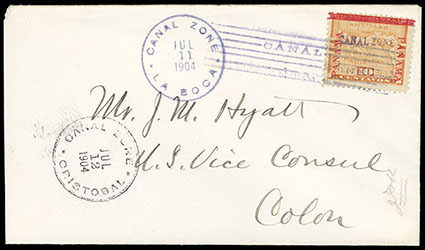 Canal Zone, 1904, 1¢-10¢ overprinted U.S. complete, neatly arranged on fresh cover to Panama and tied by purple bar handstamps, with matching "Ancon, Dic 8, 1904" cds; cover opening edge slit at lower left, Very Fine and choice, a lovely complete set on cover. Scott No. 4-8 Estimate $200 - 300.